From multicultural Raval to the hectic expanse of Las Ramblas, from the Gothic Quarter’s medieval churches to Eixample’s startling modernism, Barcelona’s neighborhoods have plenty to offer the traveler. Here are six to get to know before you visit. 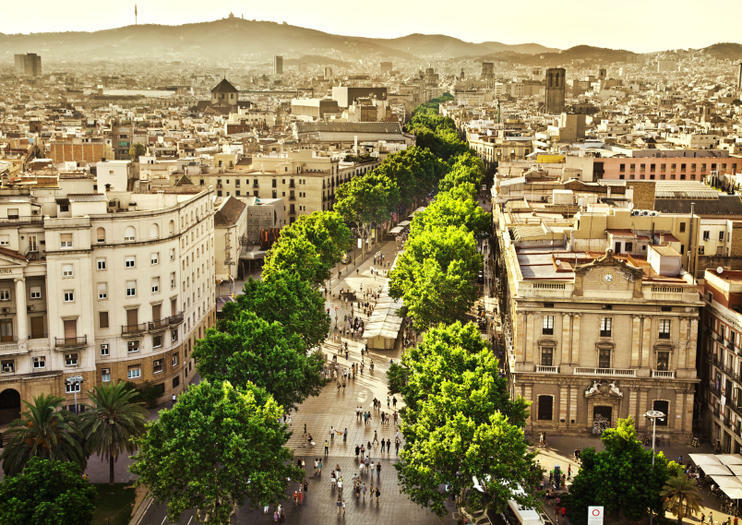 No trip to Barcelona is complete without a stroll among the crowds that frequent Las Ramblas (or La Rambla), a wide promenade that’s the city’s answer to Times Square. Head here for people watching, living statues, souvenir stores, and a wealth of food and drink, particularly the historic La Boqueria Market. The Gothic Quarter (Barri Gótic) is a highlight of Barcelona’s old town and an essential stop on any Barcelona visit. Narrow, winding streets are home to ancient delights, from the city’s best-preserved stretch of Roman wall to the spectacular Cathedral of Barcelona and the much-photographed Pont del Bisbe bridge. This vibrant downtown neighborhood with its charismatic alleyways is where the locals go for wine, vermouth, and tapas, and the pedestrianized Passeig El Born is a great place to start. But there’s also culture here, including the Picasso Museum and the exuberant Palau de la Música Catalana, the perfect choice for a night of flamenco. Lively, multicultural, and, yes, still a little seedy in places, Raval is rapidly gentrifying, with artists’ studios and hip bars springing up apace. Highlights include Gaudi’s Palau Güell mansion, the landmark MACBA (Barcelona Museum of Contemporary Art), and the Filmoteca cinema. The leafy streets and shady squares of Poble Sec, part of the Montjuïc district, belie the area’s cutting-edge dining scene. Besides contemporary tapas joints and cool bars, it’s home to the Spanish Village (Poble Espanyol), an open-air architectural museum; Mercat de les Flors, a center for contemporary dance; and theaters including BARTS. Barcelona’s most celebrated architect, Antoni Gaudí left a trail of sinuous, organic-seeming buildings across this stylish neighborhood, including La Sagrada Familia, La Pedrera, and Casa Batlló. Besides his masterworks, Eixample is home to sleek boutiques and diverse nightlife and hosts the heart of Barcelona’s LGBTQ scene. Visit a creative neighborhood that overflows with student cafes and artwork on a walking tour of Raval. Exploring the Raval with a local guide unlocks the stories behind the neighborhood’s colorful landmarks, from Palau Güell to the Mercat de Sant Antoní, and you’ll get a mix of history and contemporary culture as you walk through the fascinating area. Eat like a local and indulge in traditional dishes and drink during this half-day, guided, food and walking tour in the El Born district. Visit bodegas, rustic bars, and tapas restaurants and learn about the city’s history, culture, and politics spanning from medieval to modern times. See how food and culture have been intertwined throughout the city’s history and visit a traditional wine bodega for a Cava tasting.